This sophisticated suite from invitation designer Janet Maples of Green Lake-based Izzy Girl blossoms with gold-foil details in a charming rose motif, plus a custom monogram belly band. Gold-foil-stamped invitation with custom laser-cut gatefold, vellum insert and custom monogram gold-foil-stamped belly band, $28.65/set. Designed by Spark Letterpress in a spring-fresh teal and gray color scheme, the “Aubrey” suite features a folder-style invitation graced with an intricate laser-cut geometric pattern, plus the couple’s signature monogram. Die-cut invitation with corresponding belly band, $4,157/set of 100, available from Renton-based Paper Passionista. With a layered accordion design that features a die-cut Mount Rainier, the Seattle skyline and a dancing scene, this invitation by Sheryl Bracken of Snohomish-based Paper Moxie beckons guests to our fair city in sweet style, complemented by a richly colored, striped sleeve. Laser-cut multi-fold invitation printed on natural white cotton paper with custom-printed artisan wrap and wax cord closure, $16/piece. Sweetened by a lace-like design in shimmering ecru, this invitation by Ruth Song of Kirkland-based Paper Fling defines modern whimsy with a monochromatic champagne-hued insert. 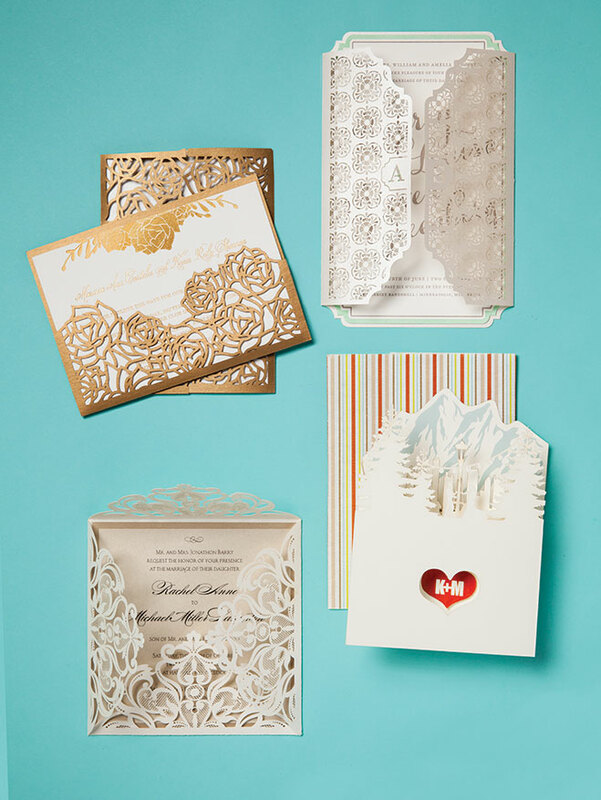 Laser-cut ecru fold-over invitation sleeve with digitally-printed insert, $839/set of 100.